Sloopin - A South Loop Blog: What's the Status of the Roosevelt Road Construction Project? What's the Status of the Roosevelt Road Construction Project? I would sure love to see some coverage of the Roosevelt Road bike lane that was written about close to a year ago. 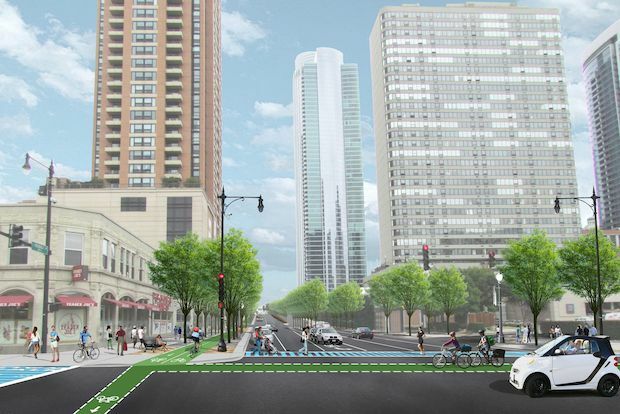 You may recall that the narrowing of Roosevelt Road (and the traffic bottlenecks that have resulted) were also supposed to result in the city’s first “raised bike lane.” The city has not delivered. Although there is a wide sidewalk, there is no bike lane. I have written to Alderman Dowell twice about this, and I have not received any response. Others may know more information, but it's our understanding that the project isn't completely done yet. Yes, most of the major changes are, but some of the cosmetic ones aren't (such as painting the bike lane). In regard to your comment about the city not delivering the "raised bike lane", we understand the confusion. Right now, it appears that the north sidewalk between Wabash and Indiana has simply been widened. However, that sidewalk is actually two "sidewalks" separated by trees and benches. The raised bike lane is there - it's just not clearly marked yet. Like we said before, we're reserving judgement until the entire project is done. However, we understand why many people are scratching their heads.